Shane Black's The Predator went through several changes in the post-production process. One of the bigger plans that didn't work out included the Emissary Predators, who originally came into the movie near the end. A new video has been released that shows off several designs for the Emissary Predators and all of the evolution that they went through over the course of the production. The video also shows how much work went into the designs before they were ultimately scrapped. In one of the first cuts of Shane Black's The Predator, the Emissary versions of the aliens came down to Earth to help out the humans. The final act involved the Emissaries as well as a giant spider-Predator hybrid, but the scenes were ditched after the first few test screenings, for reportedly being too confusing to the story. Now, a new video has surfaced and it gives us a hint of what we were going to see on the big screen. The two Emissary Predators were going to be older and were given a more "scientific" look. When looking at the original designs for the Emissary Predators, it's interesting to see that they started with almost tribal clothing, which seems like a step back from the technological advancements of the aliens. However, they are supposed to be a bit older, and as the video goes on, we see more designs that utilize a suit and a mixture of the tribal gear, as well as some subtle body shape changes. In the end, they looked pretty much like the original aliens shown off in The Predator, but looking a little older. They don't resemble the Ultimate Predator at all after its genetic modifications. Shane Black had to go through a lot of The Predator to make some pretty big changes that resulted in a movie with some pretty big visual scars. 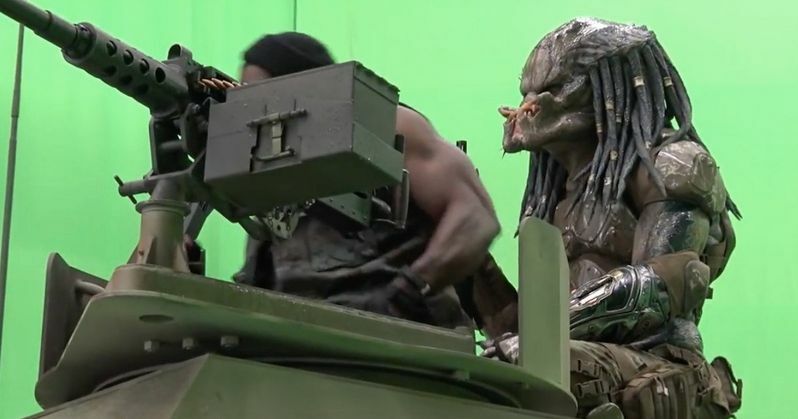 There's the rushed CGI at the very end that gave us the Predator Killer suit out of nowhere, which was at one time going to have connections to the Alien franchise. Additionally, the entire third act was reshot, leaving some spots where daylight can be seen, even though they changed it to fighting in the dark against the Ultimate Predator. It was Shane Black's intention to make a sequel to The Predator, but that doesn't look like it's going to happen any time soon after the box office failure and critical bashings that it took. One has to wonder if the movie would have been better if Black wasn't forced to make all of the changes that he did. With that being said, we'll probably never know unless Black gets to release his original cut, which more than likely would not have finished special effects. You can check out the awesome designs for the deleted Emissary Predators below, thanks to the Studio ADI YouTube channel.